Pick-Up & Shipping Information - SUPERIOR AUCTION & APPRAISAL LLC. Important Information About Picking Up Or Having Your Items Shipped. Below Are Some Things To Keep In Mind About Picking Up Or Having Your Order Shipped. Bring Proper Equipment For Loading! Some items you buy may be to large to move by hand. Be sure to bring dollies or other needed moving equipment. Also, if you are planning to buy larger items, be sure that you have the proper vehicle to haul your load. If you need to make multiple trips, be sure to come early enough to do so. 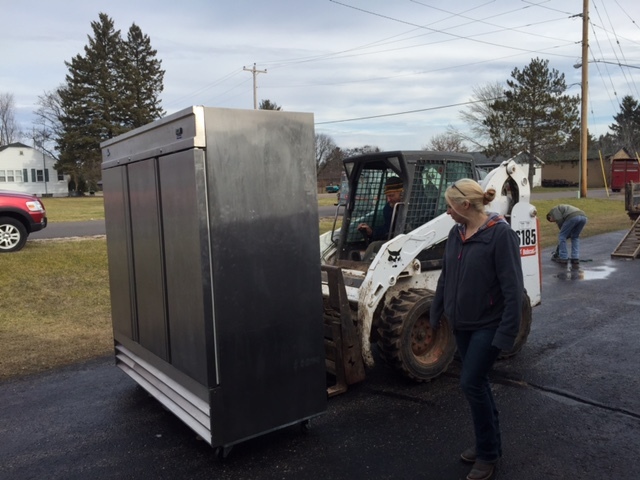 We DO NOT haul items back to the office for pick-up unless you are having your items shipped to you or have made special arrangements. Bring Boxes, Totes & Other Packing Materials! While some items may already be in boxes or properly packaged, it is a good practice to be prepared to pack your items. We do the best we can to gather your order to make it easy for you. We pick all of your lots and try to stage them together, but we do not box or pack your items unless your item is being shipped to you. So, if you have many small or breakable items, bring your own packing supplies. We will not have any supplies available to use at time of pick up. Onsite, we are very busy with things that we need to do to make sure that everyone gets their merchandise. If you buy something that is going to require more than on person to lift, plan ahead and phone a friend to come and help. Don't come alone. Call Or Email Ahead To Arrange Shipping! If you can't make the pick up time or are simply to far away to come, talk to us ahead of time about shipping. We will happily ship most items to you, depending on the size of the item(s)! Larger items can be shipped but we will not handle these arrangements. 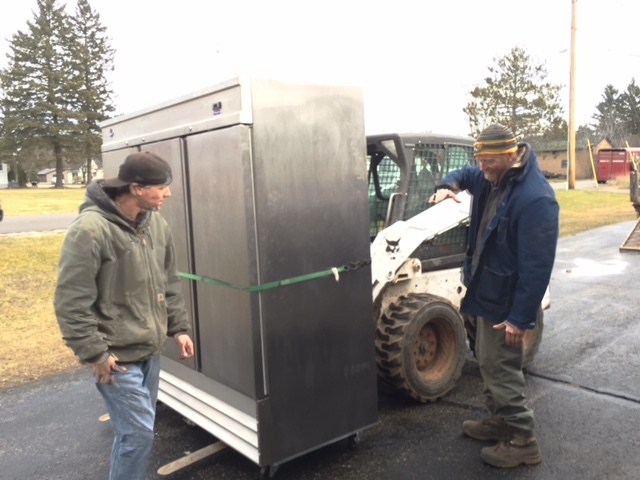 If an item is to large to simply be packed in a box, you will have to contact an LTL Freight Service Or Other Moving Service To Arrange Shipping from the pick-up location. The best option is to call us so we can come up with a plan that works for everyone. Each auction has an allotted time for pick-up. Most of the time we are not ready to start pick-up until the announced start time. If you come to early, we may not have your order ready for you and you'll have to wait. In most cases there is two to three hours of time allocated to pick-up, be sure that you will be able to be in and out in this time frame. If you need to make multiple trips, be sure to come early enough to do so. Bringing a copy of your invoice with you makes it easier for us to quickly find and get you your order. It also helps to prevent any confusion in the event of technical difficulties. And also gives you an easy way to verify your order! Where To Find Auction Pick Up and Shipping Information! 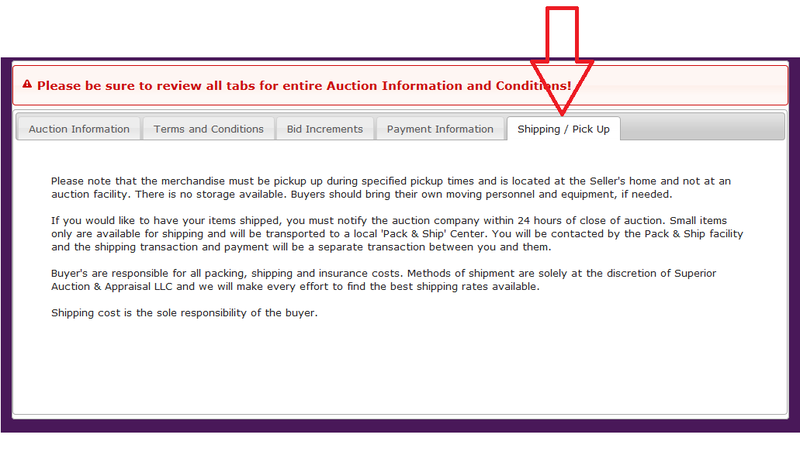 After Clicking "Auction Details" You Will Be At A Screen That Has Five Tabs. The First Tab Is "Auction Information". Here You Will Find All Of The Basic Information You Need To Know About The Auction. Here You Will Find Dates/Times Of Bidding, Preview, And Pick-up. 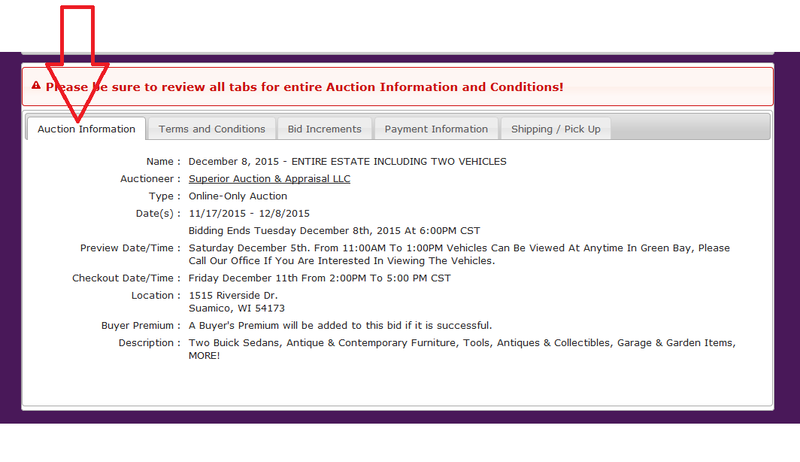 Auction Location and Auction Type Are Also Listed Here. The Final Tab Is "Shipping/Pick Up". Here You Will Find All The Information You Need To Know About Shipping & Pick Up Options.